This is a tale of the old time, of Glooskap, the mighty Magician, who came from the Land of the Red Sunrise, sailing over the seas in a stone canoe. Stately and handsome was the Magician, and very brave; and when he reached the country of the Wabanaki, he found it filled with Witches, Giants, Sorcerers, and Fiends. He pursued and killed all these evil creatures, so that the Wabanaki dwelt once more in safety. Then Glooskap, ere he got again into his stone canoe to return to the Land of the Red Sunrise, sent his faithful messengers, the Loons, to all the Indians. And his message was that before he departed he would grant one wish to every brave who visited him in his magic lodge. Now this magic lodge in which Glooskap dwelt was on a great island, far from men, and the way leading to it was filled with dangers and terrors. Many braves set out to gain their wishes, but perished. At last three Chiefs, more fortunate than the others, followed the long trail that led to Glooskap's lodge. For seven years they travelled on through the dangers and terrors, until at last they heard the barking of Glooskap's Dogs. And so they found the magic lodge, and entered it. The great Magician welcomed them, and his younger brother, Martin the Fairy, placed a feast before them. So they ate and rested. Then Glooskap, addressing the eldest Chief, bade him tell his wish. "My needs are few," replied the man, "but I wish to be a great hunter. I wish to excel all other men in catching and shooting game. Then the aged, the women, and the children will suffer hunger no more during the long, cold winters when the Bear sleeps and the ice, like a stone, covers the face of the stream." At this Glooskap smiled and gave him a flute, saying: "Take this magic pipe. Its music will charm the ear of every animal that hears it and will force the creature to follow you. But do not put the pipe to your mouth until you reach your lodge." The man took the gift, well pleased, and, thanking Glooskap, departed. 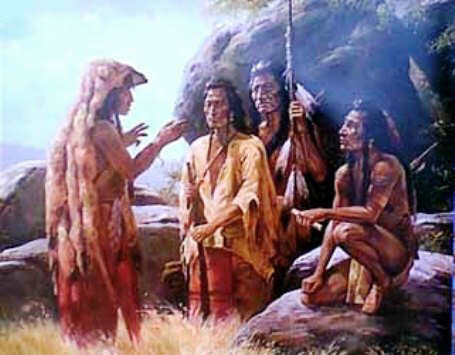 Then Glooskap bade the second Chief tell his wish. "I am very handsome," replied the young man, "but the girls of the tribes do not think so, and I have never won a wife. I wish to have the admiration of every woman who sees me, then I can choose the wife I most desire." At this Glooskap frowned, but he gave the young man a small bag of deerskin tightly tied. "Take this bag," said he. "Its contents will make every woman who looks upon you desire to be your wife. But do not open the bag until you reach your lodge." The young man took the gift with delight, and, thanking Glooskap, set out on his way. Then Glooskap bade the third Chief tell his wish. "I am young and witty," the Chief replied, "but when I relate my tales before the lodge fire the people never laugh. I wish always to be merry-hearted, and to have the power of making old and young laugh loud and long." Again Glooskap frowned, but he sent Martin the Fairy to seek a certain magic root in the woods. When Martin brought the root, Glooskap gave it to the Chief, saying: "After you have eaten this, your mouth will utter such merry sounds that all who hear will laugh loud and long. But do not even taste the root, until you have reached your lodge." The young man took the gift with joy, and, thanking Glooskap, set out on his way. Now, the first Chief, the hunter, with the flute in his pocket, hastened home well content, for he knew that he could always provide food for the aged, the women, and the children. He ran swiftly along the trail, and though it had taken seven long years to reach Glooskap's lodge, it took scarcely seven days to return to his village. And when he entered his own lodge, he put the flute to his lips, and from that day he was a great hunter. But the second Chief, who had never won a wife, did not go far along the trail before he began to desire exceedingly to see what was in the bag. Carefully he untied the string, and there flew forth hundreds of beautiful maidens, like a cloud of white Doves. With sparkling eyes and flowing hair they circled about his head singing sweetly. Then winding their arms around him, they kissed him until he was smothered. And so he perished. As for the third Chief, who wished to make all laugh loud and long, he hastened along the trail with the root in his pocket. Forgetting what Glooskap had commanded him, he drew forth the root and, putting it in his mouth, ate it. Scarce had he done so when wild and piercing sounds came from his lips. But he walked gayly onward, thinking to make all who heard laugh loud and long. The animals bounded away in terror before him, and as he neared his village the people fled with shouts. And when darkness came, an evil Spirit of Night swooped down and bore him away to its hole, and he was never seen again among men. Then Glooskap, the mighty Magician, arose and left his magic lodge. He made a rich feast by the shore, and invited all the animals to it. After which he entered his stone canoe, and, singing sweetly, sailed away over the seas, from the Country of the Wabanaki to the Land of the Red Sunrise.